Resorts World Sentosa (Abbreviation: RWS) is an integrated resort on the island of Sentosa, off the southern coast of Singapore. The key attractions include one of Singapore's two casinos, a Universal Studios theme park, Adventure Cove Water Park, and S.E.A. Aquarium, which includes the world's second largest oceanarium (after Chimelong Ocean Kingdom). The S$6.59 billion (US$4.93 billion) resort was developed by Genting Singapore. It was the third most expensive building ever constructed in 2010. The resort occupies over 49 hectares (120 acres) of land and, when fully open, will employ more than 10,000 people directly. Resorts World Sentosa is a sister resort to Resorts World Genting, Pahang, Malaysia and Resorts World Manila, Philippines. The soft launch of the first four hotels took place on 20 January 2010, with the FestiveWalk shopping mall following on 1 February. The casino opened on 14 February 2010 on the first auspicious day of the Chinese New Year. The Maritime Experiential Museum opened on 15 October 2011 and the last attraction opened on 22 November 2012, The Marine Life Park. The grand opening of the integrated resort was held on 7 December 2012, officiated by Prime Minister Lee Hsien Loong together with Genting Group Chairman Lim Kok Thay. Resorts World Sentosa is also expected to hold large-scale exhibitions such as Valentino, Retrospective: Past/Present/Future. Construction of Resorts World Sentosa Singapore began on 16 April 2007 on the demolished plot of Imbiah Lookout. It opened in a record time of 34 months of construction on 20 January 2010. Crockfords Tower, Hard Rock Hotel Singapore, Festive Hotel and Hotel Michael opened 20 January 2010, followed by FestiveWalk on 31 January 2010. Resorts World Sentosa Casino opened on 14 February 2010. Universal Studios Singapore was opened for a sneak peek week in view of the Chinese New Year Celebrations, from 5 pm to 9 pm every night between 14 and 21 February 2010. The whole park was opened but none of the rides was operational. Visitors had to pay SGD10 to get into the park. Park tickets for the week were sold out in 2 days. The park had its soft opening period from 18 March 2010 to 26 October 2010. 10 October 2006 – Genting International and Star Cruises submitted its proposal, suitably named Resorts World at Sentosa to the Singapore government. 16 October 2006 – Genting International and Star Cruises unveiled its proposal "Resorts World at Sentosa". 8 December 2006 – Genting International and Star Cruises won the bid for the Sentosa IR. 16 April 2007 – Resorts World at Sentosa broke ground on 49-hectare site. 7 November 2007 – Resorts World at Sentosa announced that it will be adding six new attractions to its resort. 1 February 2010 – Opening of Resorts World Station of Sentosa Express. 14 February 2010 – Opening of Resorts World Sentosa Casino. Late February 2010 – Opening of Link Bridge from Resorts World Sentosa to Imbiah Lookout. 18 March 2010 – Soft opening of Universal Studios Singapore. 2 July 2010 – New Lake Hollywood Spectacular show on Friday and Saturday nights at Universal Studios Singapore. October 2010 – Opening of Candylicious, one of Asia's largest candy store. Late October 2010 – Opening of Waterfront Area. 25 December 2010 – Opening of Crane Dance. 15 October 2011 – Opening of Maritime Experiential Museum. 16 February 2012 – Opening of Equarius Hotel and Beach Villas. 6 July 2012 – Opening of ESPA by RWS. 7 December 2012 – Official Opening Ceremony of Resorts World Sentosa. 9 April 2013 – Unveiling of dolphins for public viewing at S.E.A. Aquarium. 22 May 2013 – Launch of Ultimate Maritime Encounters with Open Ocean Dive at Adventure Cove Waterpark. 15 June 2013 – Launch of Shark Encounter at Adventure Cove Waterpark. 30 June 2013 – Launch of Sea Trek Adventure at Adventure Cove Waterpark. 30 September 2013 – Opening of Dolphin Island at Marine Life Park. 15 Jan 2016 - Announcement of Donnie Yen and his wife Cissy Wang as brand ambassadors and spokesperson(s) for RWS. The resort was designed primarily by American architect Michael Graves. The six hotels offer a total of 1,840 rooms for accommodation. Each hotel is designed with a different theme, catering to both the leisure and business visitors. The resort is split into the west, central and east zones. Four hotels are located in the central zone. Crockfords Tower, formerly planned to be named Maxims Tower, is an 11-storey all-suite hotel overlooking the Singapore harbour and the Southern Islands. The resort's casino is located beneath the tower. The hotel was topped-out on 27 February 2009 and opened on 20 January 2010. Both the latter and Hotel Michael sit on the area of the former Sentosa Musical Fountain The hotel also features Crockfords Premier, a casino club with private rooms for High Roller located on 10th floor. Festive Hotel is a family-oriented hotel next to Crockfords Tower and Festive Walk. Beneath the hotel is Festive Grand, a 1,600 seat plenary hall which will host Resorts World Sentosa's resident musical Voyage de la Vie. The Hard Rock Hotel Singapore is the site of meeting and conference facilities, and indoor exhibition space. This includes 26 differently-designed function rooms and one of Asia's largest ballrooms with seating for 7,300 guests. Construction of Singapore's first Hard Rock Hotel started in May 2008, and the hotel opened on 20 January 2010. Equarius Hotel is situated at the west of the resort. The Royal Albatross is berthed at the Historical Ships Harbour, beside S.E.A Aquarium and the Adventure Cove Waterpark. Her dinner cruise, Sunset Sail City Lights, is held every weekend evening. Starting from her berth, the dinner cruise will take guests past the beaches of Sentosa to the outskirts of Marina Bay, around the edge of the Southern Islands and back to Sentosa. She is available for private charters as well. The casino, capped at 15,000 sq.m. by regulation, is located beneath Crockfords Tower. Government regulations also require Singapore citizens and permanent residents to purchase a S$150 day pass or S$3000 yearly membership for access into the casino. Both types of entry levy (daily or yearly) allow the patron to visit to only one casino. Foreign citizens can enter free of charge with their passports or employment passes. The entry fees are collected by the Singapore Totalisator Board and used for public and charity causes. The casino does not keep any portion of the fees. In May 2011, the Casino Regulatory Authority fined Resorts World Sentosa for two violations related to reimbursements and two other violations related to surveillance practices. The total fine was S$530,000 (US$425,000). Voyage de la Vie is the first permanent production show to open at Resorts World Sentosa. This resident rock musical is set in the Festive Grand Theatre with a capacity of 1,600 people. The production was created by Mark Fisher. Martial Combat, Asia's largest mixed martial arts fighting championship, is staged over six months each year at the Compass Ballroom, and broadcast by ESPN STAR Sports. Crane Dance is a multimedia moving art installation with choreographed animatronic cranes built over the sea, and designed by Jeremy Railton. Edward S. Marks and Bob Chambers (of The Producers Group) were brought on to oversee the construction, installation and programming of the Cranes. Marks served as Project Director and Producer while Chambers served as its Senior Technical Director. It opened on 25 December 2010. Lake of Dreams is a multimedia spectacular that combines the elements of water, fire, air and light, designed by Jeremy Railton. Edward S. Marks and Bob Chambers oversaw the construction, installation and programming of this attraction as well. Equarius Hotel, close to the Adventure Cove Waterpark. Beach Villas, a collection of 22 villas floating on a lagoon. It opened on 16 February 2012. Marine Life Park, the world's largest oceanarium, opened its doors on 22 November 2012. The park houses two attractions, the S.E.A Aquarium and the Adventure Cove Waterpark, previously known as the Equarius Water Park. The Maritime Experiential Museum was opened on 15 October 2011 that features more than 400 artefacts and replicas with a 360-degree Multi-sensory Typhoon Theatre. It is the only museum in Singapore to display the history of ancient maritime trade where visitors have the opportunity to immerse themselves in the history of maritime Silk Route from the 15th to 19th century. The museum consists of more than 10 interactive points as well as an experience to board on the authentic harbour ships from Asia docked outside the museum. Also, it will become the permanent home of the Jewel of Muscat, a gift from the Oman Government. The Royal Albatross is berthed at the Historical Ships Harbour, beside S.E.A Aquarium and the Adventure Cove Waterpark. She sails twice every weekend evening. Starting from her berth, the dinner cruise will take guests past the beaches of Sentosa to the outskirts of Marina Bay, around the edge of the Southern Islands and back to Sentosa. She is available for private charters as well. Universal Studios Singapore is Southeast Asia's first Universal Studios theme park and opened its doors on 18 March 2010. It features 24 attractions and is divided into seven zones – including Sci-Fi City, Ancient Egypt, New York, The Lost World, Far Far Away, Madagascar and Hollywood. 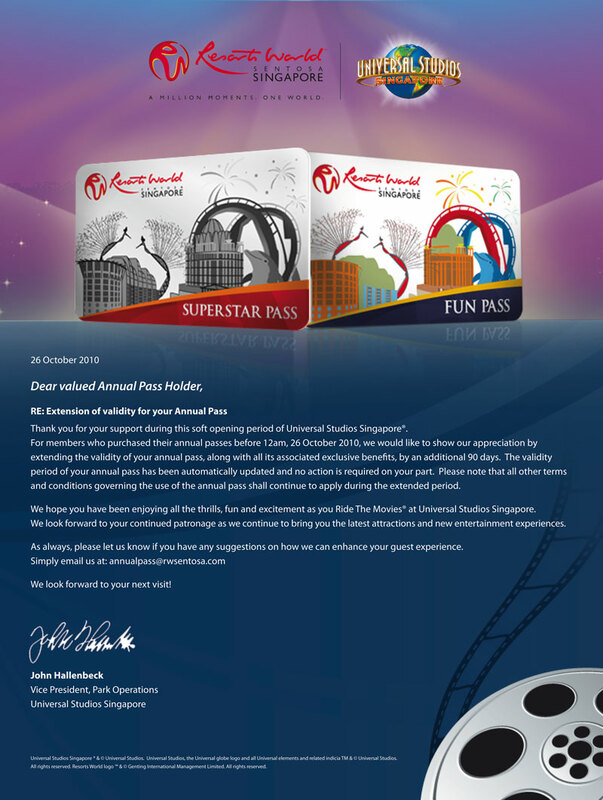 ^ "Resorts World® Sentosa Singapore's First Integrated Resort Opens from 20 Jan 2010" (PDF). Archived (PDF) from the original on 5 April 2017. Retrieved 5 April 2017. ^ "Resorts World Sentosa, Singapore's First Integrated Resort Casino opens 14 Feb 2010; Celebrates with Universal Studios Singapore Previews". Archived from the original on 14 February 2010. Retrieved 11 February 2010. ^ a b "Discovering Southeast Asia's maritime history". Resorts World Sentosa (Official Blog). Archived from the original on 4 December 2011. Retrieved 14 September 2011. ^ a b c "World's Largest Oceanarium opens at Resorts World Sentosa 22nd November 2012". Resorts World Sentosa. Archived from the original on 21 December 2012. Retrieved 20 November 2012. ^ "Resorts World at Sentosa breaks ground on 49-hectare site". Archived from the original on 3 March 2016. Retrieved 29 June 2012. ^ Lim, Jessica (2010). Universal Studios opens Sun. Retrieved on 7.06.10 from Stratis Times Archived 14 February 2010 at the Wayback Machine. ^ Resorts World Sentosa (2010). Extension of validity for your annual pass. Retrieved on 8 November 2010 from Picasa Archived 29 May 2014 at the Wayback Machine. ^ "RWS to open last 2 of 6 hotels on Thursday". Channel News Asia. 13 February 2012. Retrieved 14 February 2012. ^ "Marine Life Park Launches Up-Close Marine Life Encounters". Resorts World Sentosa. 21 May 2013. Archived from the original on 1 October 2013. Retrieved 11 August 2013. ^ "Resorts World Sentosa's Dolphin Island to open on Sept 30". The Straits Times. 19 August 2013. Archived from the original on 19 September 2013. Retrieved 19 August 2013. ^ "Donnie Yen, Cecilia Wang new brand ambassadors for Resorts World Sentosa". Channel News Asia. CNA. Archived from the original on 18 January 2016. Retrieved 17 January 2016. ^ "Maxims Tower, Hotel Michael and Festive Hotel will open in early 2010…". 24 April 2009. Archived from the original on 24 April 2009. ^ "E-News Bulletin Issue 8". Archived from the original on 1 February 2010. Retrieved 15 February 2010. ^ "ChildAid to be FIRST event held at Resorts World Sentosa" (PDF). 14 July 2009. Archived from the original (PDF) on 6 August 2009. ^ The Economist, "Sin galore Archived 6 March 2011 at the Wayback Machine", 26 February 2011, p. 72. ^ "Casino at Resorts World Sentosa, Singapore – Gaming at a Glance". Archived from the original on 5 July 2011. Retrieved 28 February 2010. ^ "Singapore exploring the best way to exhibit Jewel of Muscat – Channel NewsAsia".